An itinerary to discover one of the most extraordinary natural beauties Qatar has to offer: the Al Thakhira mangrove forest north of Doha, which we explore as we paddle on a kayak. A one-hour ferry transfer takes us to the fishing village of Al Khor on the coast north of Doha, a place that is undergoing a major transformation as it was chosen as the location for one of the 8 stadiums that will be built in view of the 2022 football World Cup. From there, we go to the nearby Al Thakhira mangrove forest, a large plant-covered area home to numerous species of birds including flamingos and herons and in stark contrast with the surrounding desert area. 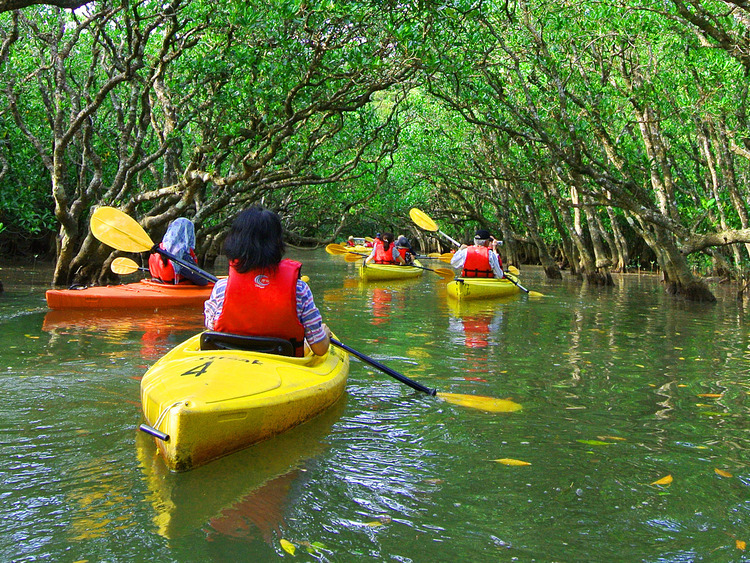 We get ready to explore the forest by kayak paddling along the placid waters along the channels created by the tides. The relaxing views and easy navigation make the experience suitable also for families with children and anyone who loves being in contact with nature. The itinerary lasts two hours, during which we get the chance to spot numerous bird species inhabiting this silent lush habitat so different from the hustle and bustle of Doha. Pregnant women and guests with heart, back or high pressure problems are not allowed on this excursion.